The cellar spider, Pholcus phalangioides, also known as the skull spider due to its cephalothorax looking like a human skull, is a spider of the family Pholcidae. Females have a body length of about 9 mm; males are slightly smaller. 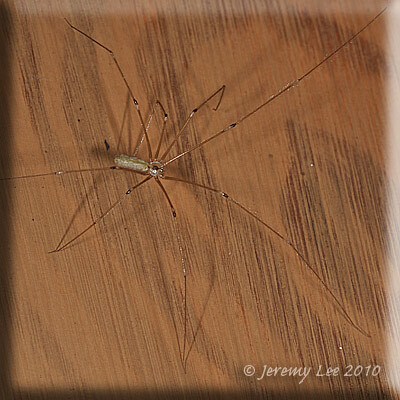 Its legs are about 5 or 6 times the length of its body (reaching up to 7 cm of leg span in females). Its habit of living on the ceilings of rooms, caves, garages or cellars gives rise to one of its common names. They are considered beneficial in some parts of the world because they kill and eat other spiders, including species that are venomous to humans such as hobo and redback spiders. It has a habit of shaking its web violently when disturbed as a defence mechanism against predators. It can easily catch and eat other spiders (even those much larger than itself, such as Tegenaria duellica), mosquitoes and other insects, and woodlice; and, when other food is scarce, it will prey on its own kind.